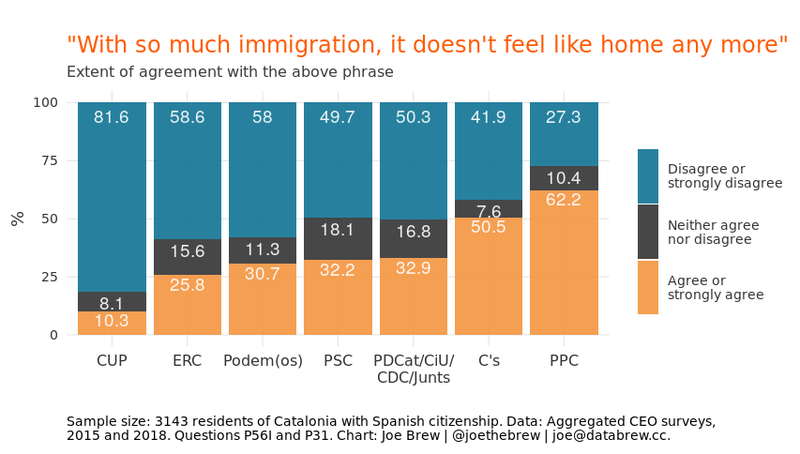 Joe Brew's tweet - "In Catalonia, anti-indepenence parties have the highest rates of xenophobia. Supporters of Ciudadanos (@ALDEgroup) and the PP (@EPP) exhibit xenophobic attitudes at rates of greater than 50%. Supporters of pro-independence parties have significantly lower rates of xenophobia. " The Catalan independence movement has been called "xenophobic" by some of its pro-Spain critics. But the actual data on xenophobia in Catalonia are quite clear. In Catalonia, anti-indepenence parties have the highest rates of xenophobia. Supporters of Ciudadanos (@ALDEgroup) and the PP (@EPP) exhibit xenophobic attitudes at rates of greater than 50%. Supporters of pro-independence parties have significantly lower rates of xenophobia. In Catalonië, vind je onder anti-onafhankelijkheidspartijen de hoogste percentages vreemdelingenhaat. Meer dan 50% van de aanhangers van Ciudadanos (@ALDEgroup) en PP (@EPP) tonen xenophobe neigingen. Bij aanhangers van pro-onafhankelijkheids partijen is dat veel minder. Right... because calling "settlers" to those coming from other parts of Spain is not xenophobic at all. And asking other Spanish fellows to leave Catalonia if they are against independence is just an isolated anomaly of the extremely welcoming spirit of Catalan nationalists. Most significant take from this: Catalan right at same level with Spanish left. That alone kind of tells the whole story (or at least a big part of it). Absolutely certain this pertains in Scotland too.